Dupuytren disease is a condition of the hand and fingers or, less commonly, the feet. Tissue thickens under the skin in the palm of your hand, and a small hard lump or nodule develops. The nodules can be painless or they can be tender, though if they are tender, the pain usually goes away. These nodules can progress to become a cord of tissue. Over months or years these cords shorten and tighten (contract). 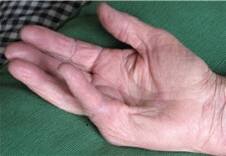 This pulls your finger into a permanently bent position (sometimes called a fixed flexion deformity). This is called a Dupuytren contracture. It is often mild and painless, but a nuisance. However, if it becomes more severe, your bent finger can stop you being able to use your hand normally. Dupuytren contracture often happens on both hands, and most commonly affects the ring or little finger. The most common age to get it is in your 50s for men, or in your 60s for women. We don't know. It often runs in families, and is more common in people from places such as Ireland and Scotland, and less common in people from Asia. People who smoke, drink too much alcohol, have diabetes or have high cholesterol are more likely to get it. Doctors diagnose Dupuytren contracture by talking to you, and then examining your hand. They may measure the angle your finger is bent to. You will not usually need X-rays, scans or tests.